Now that’s a news we are making recently- Innofied expands their reach to NewYork, Sydney and San Francisco as one of the top mobile app developers in 2018. And in this run, Clutch recognized us as one of the top B2B service providers in 2018. That happened all because we believe in exercising our creative genius to create shockingly simple digital experiences that will drive better results and boost the bottomline. We are technology freaks, stationed around the world who have the knowledge and experience to take on any project. We are excited about what we’ve accomplished here, and our awards speak for themselves. However, what we most cherish is our clients’ opinions. As such, we’re always on the prowl for new ways to grade ourselves and get in touch with our customers. The B2B ratings and reviews site, Clutch, accomplishes that by compiling client feedback, case studies, and in-depth quantitative analyses in order to gain market insights. Based in Washington, D.C, the firm (Clutch.co) is known to establish a reliable baseline for industry success and individual company excellence. In total, the company makes transactions more efficient and transparent. 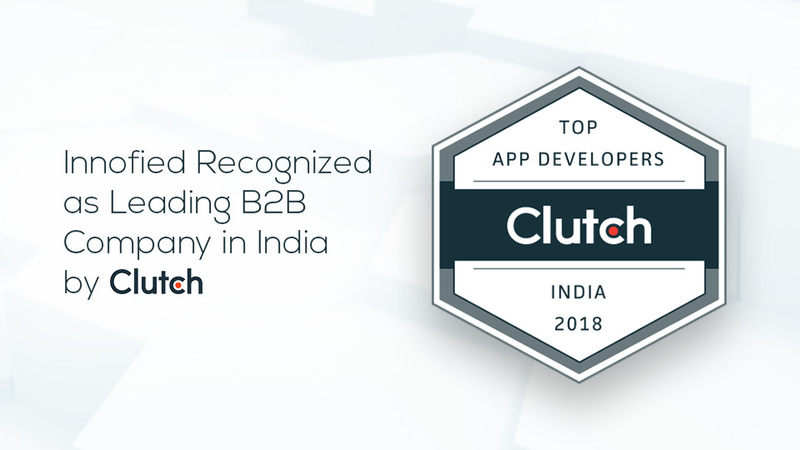 Clutch recently recognized Innofied one of the top B2B service providers in India, leading in categories such as Mobile app and Android app development. A huge shout out is owed to our clients who facilitated productive partnerships and provided Clutch with candid and revealing information. Not Just for iOS We’re Known for Android Too! Clutch not only dug into our mobile iOS app portfolios but clearly appreciated our Android apps, as well. They gave us a top spot for Android app developers in India! Additionally, “The Manifest” featured us on their shortlist of the best app developers from around the world. The Manifest is Clutch’s sister website, providing insights on business news and industry lists. We are proud to receive recognition on both the platforms. How We Achieved This MileStone? Founded in January 2012, we determine the Minimum Viable Product, conduct a feasibility study, prepare a scope of work (SOW) listing, log ‘Change Requests’, revise, and perform many more steps in between. What Happens After MVP is Ready? Moreover, our greater than 100 person team has delivered over 400 apps to about 150 clients. Those apps have garnered over 6 million downloads. With the use Clutch listing, we are able to conduct client interviews. And we are able to connect with our clients in a better and more personalized manner.